After their defeat by title rivals Manchester City earlier this month, Premier League leaders Liverpool could ill-afford another slip-up at home to Crystal Palace but trailing 1-0 at the break they had to face up to that possibility. Former Liverpool manager Roy Hodgson had set Palace up perfectly to do a similar job to the one the south London side delivered in their victory at Manchester City last month. A deep back-four protected by a defensive five-man midfield was disciplined and designed to frustrate but the ever dangerous Wilfried Zaha and the under-rated Andros Townsend offered a threat on the counter-attack. The pair combined for Townsend's goal to put Palace 1-0 up and leave Liverpool coach Juergen Klopp with some work to do in the dressing room at the break. 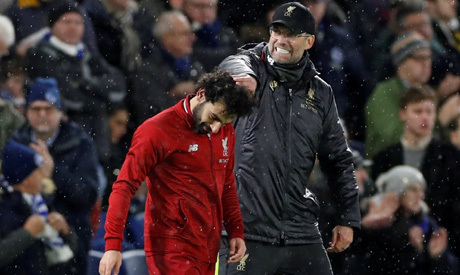 Whatever he said certainly had an impact -- it took 47 seconds for Mo Salah to get Liverpool level and, even after Palace levelled the game at 2-2, the Egyptian was on hand to profit from keeper Julian Speroni's error and put them 3-2 up. “We talked to each other (at halftime) that we had to be strong mentally because this is a tough time," said Salah. “This is the most important time for us, when you are struggling you have to be strong in mind, so we talked together and the manager also gave us information and we played well and we deserved the game," he said. The 26-year-old added that there was no question of Liverpool, whose performance was far from their best, being complacent against lowly Palace. “We expected before the game that it was going to be very difficult," said Salah, who has now reached the milestone of 50 Premier League goals in 72 appearances. “First half they played well and they played well also (in the) second half but they were staying (close) to the box and it was a tough game. But in the end the most important thing for us is the result and we got a good result. “We conceded three goals, it’s hard a little bit but we have to accept it. This is football and we have to live with that," added the league's top scorer with 16 goals. Klopp expected to see a fighting approach from his side, who mvoed a provisional seven points clear at the top. "Nobody should be surprised by the character of the boys. If something was here before I came in, it was character. "Outstanding character and the work rate was always there and we have to mix it in with a few more elements. The boys are ready to fight for all. It was not the first moment we had to show it but it was pretty special," he said.